With a stay at Heritage Auckland, you'll be centrally located in Auckland, steps from SkyCity Casino and 4 minutes by foot from Sky Tower. This 4.5-star hotel is 0.4 mi (0.7 km) from Princes Wharf and 0.5 mi (0.7 km) from Auckland Ferry Terminal. Make yourself at home in one of the 185 air-conditioned rooms featuring refrigerators and minibars. Flat-screen televisions with satellite programming provide entertainment, while complimentary wireless Internet access keeps you connected. Private bathrooms with bathtubs or showers feature complimentary toiletries and hair dryers. Conveniences include safes and desks, and housekeeping is provided daily. Enjoy a range of recreational amenities, including a health club, an outdoor pool, and an indoor pool. This Art Deco hotel also features complimentary wireless Internet access, concierge services, and babysitting/childcare (surcharge). Satisfy your appetite for lunch or dinner at the hotel's restaurant, Hectors Restaurant, or stay in and take advantage of the 24-hour room service. Quench your thirst with your favorite drink at the bar/lounge. Buffet breakfasts are available daily from 6:30 AM to 10 AM for a fee. Business center: Heritage Auckland has 2 business centers in each wing of the hotel providing computer terminals with high-speed Internet access. There are also 7 meeting rooms, including a Heritage Grand Tearoom of 460 square meters. A range of conference equipment is available. Secretarial and business services may be arranged through reception. Internet access: Heritage Auckland has complimentary WiFi in the lobby and rooms, for up to 2 GB per day. Conference/function room(s): The Grand Tearoom at Heritage Auckland is 460 square meters. It has Art Deco décor and sweeping harbor views. The 128-square-meter Calder Mackay Room, which also has natural light, can host 100 for cocktails, 60 in theater style or 16 in classroom style, and can be divided into smaller units. The 82-square-meter Peter Healey Room, which can be divided in two, seats 36 in classroom style or 50 for banquets. The Robert Laidlaw Room is 300 square meters, accommodating up to 250 for cocktails or 300 in theater style, and can be divided into two equal parts. There are 2 other small meeting rooms. A complete range of audiovisual services and equipment is available in house through an outside technology provider. Catering is also provided on site. Hector's Restaurant - Enjoy award-winning chefs in an inspiring atrium setting at Hectors Restaurant Auckland. Up to 120 diners can sample selections from a celebrated Pacific-rim menu under the canopy of native palms and shade sail clothes, which evoke Auckland's maritime tradition. A raw food bar option is available at breakfast. Open daily from 6.30 AM - 10.30 PM. Lobby Bar Relax - Unwind with your own window to the world outside. The stylishly refurbished Lobby Bar is open day and night, and offers the perfect place to meet, greet and savour a range of delicious cafe style food or a finely made drink in the evening. A new tapas menu is also available to tempt your tastebuds. Most of our products are sourced locally. Our Healthy Menu in the Lobby Bar and vegan menu options in Hectors Restaurant are steps towards our commitment to customers for providing a healthy and fresh meal. 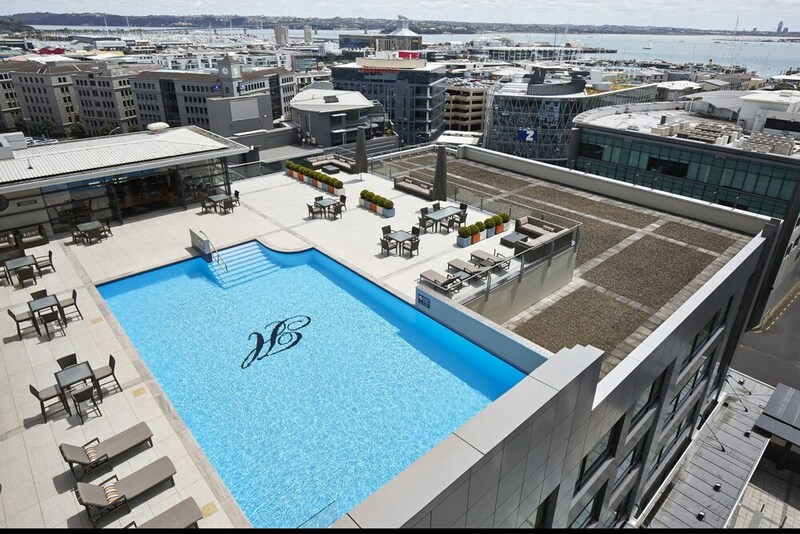 Heritage Auckland features a fitness center with sweeping views of the city and harbor. There is an indoor, heated lap pool with adjacent fitness center. Guests may use either facility. There are also saunas and a spa tub. Auckland is known as the City of Sails and there are ample opportunities for sailing around its harbour and islands. Main Harbour (approx. 10 km away) offers a boat launch, motorboat rental and windsurfing, while Mission Bay (approx. 7 km) has jet skiing and water skiing. The Harbour Bridge (2.5 km) has a famous bungee-jump, while Sky Tower in central Auckland (less than 500 metres) has a daring adrenaline activity known as Sky Jump. The large public park, Auckland Domain (2.5 km), is ideal for walking and jogging. Aerobics classes are available at the University of Auckland; Pilates and yoga in Victoria Street, both a short walk from Heritage Auckland. The Parnell Tennis Centre (approx. 5 km) has squash and tennis. Across the Harbour Bridge on the North Shore, Takapuna offers ten-pin bowling and windsurfing on Lake Pupuke (10 km). Coastal walks run for 25 km and can be joined at Takapuna Beach. The suburb of Bayswater offers kite-surfing and paragliding (14 km). Visitors can use the Takapuna Public Golf Course (7 km) or the Waitemata Golf Course in Devonport (10 km) by arrangement. Only registered guests are allowed in the guestrooms. The property has connecting/adjoining rooms, which are subject to availability and can be requested by contacting the property using the number on the booking confirmation. Free in-room WiFi has a 5-device limit. Parking height restrictions apply.